Do you like that down home country look? I have a candle holder craft I think you will love. 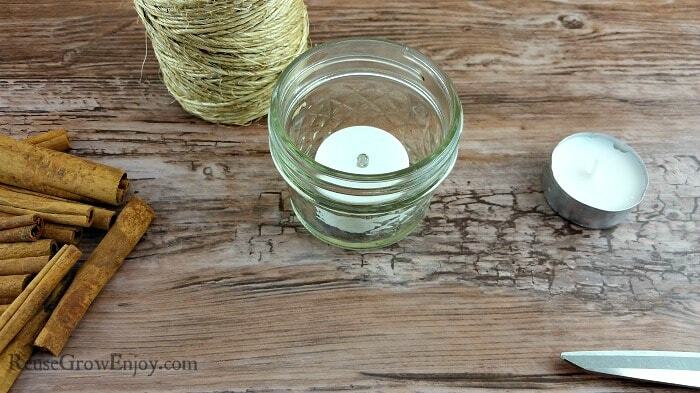 This Cinnamon DIY Candle Holder is really easy to make and it only takes just a few minutes to do! 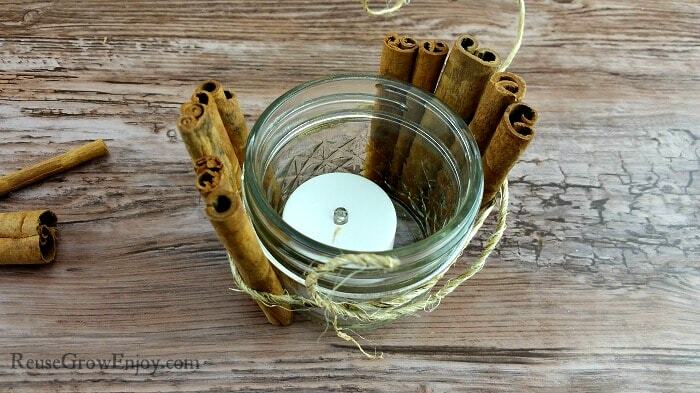 When making my cinnamon DIY candle holder I did not glue my cinnamon sticks in place, just in case I ever wanted to use the jar for something else. If you will be leaving it as a candle holder, you can hot glue them in place to make it a little easier to work with. This DIY candle holder can be used with real tealight candles or if you worry about it getting knocked over and worry about a fire, you can use one of the little battery candle lights. You can find those anywhere, like dollar stores or even on Amazon. First thing you want to do is place the candle you want to use in the jar. Now, you want to tie the twine around the jar. 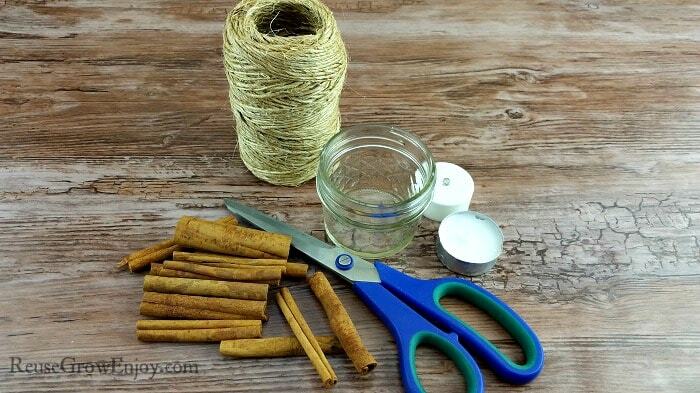 Be sure to leave a large gap when you tie it, so that we can place the cinnamon sticks in place. The next step is a little tricky. We need to place the cinnamon sticks around the jar. If you are gluing them in place, this will not be hard for you and you may even want to do so before you tie the twine. But if you are doing like I did and not gluing them in place, we need to slide a few in on one side of the jar, then while kinda holding those upright, slide a few in on the other side of the jar. That way it holds the twine up in place so that we can carefully add the rest of the cinnamon sticks around the jar, pushing and moving them as need until the whole jar is wrapped with cinnamon sticks. 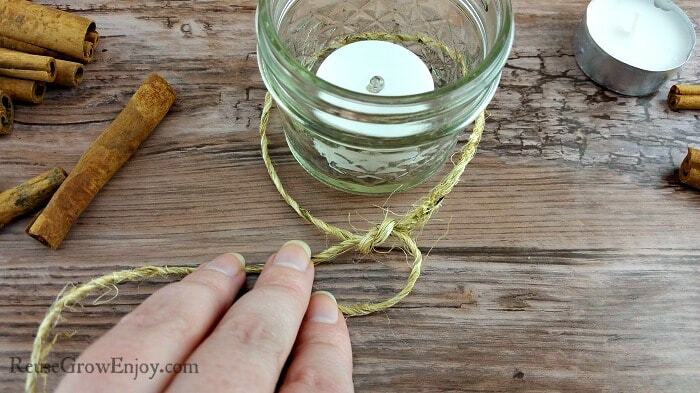 The last step to your DIY candle holder is to tie a bow in the twine. You do that the same way you would tie your shoe. That is it! You now have a very cute country looking candle holder! 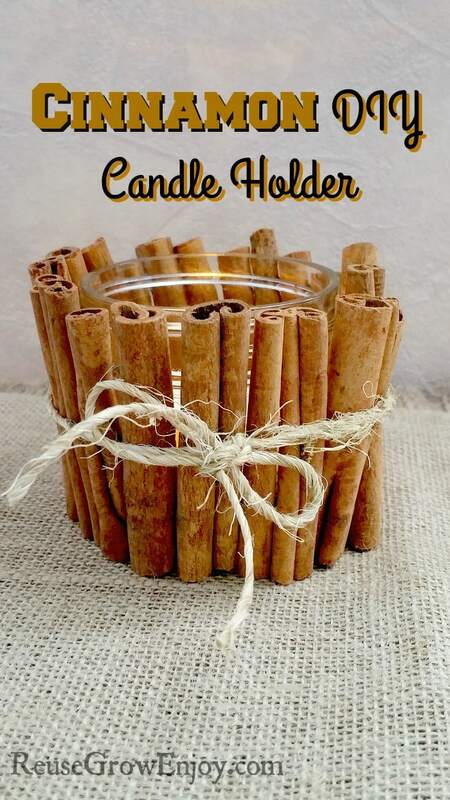 If you liked this craft for a cinnamon DIY candle holder, you may want to check out a few of my other crafts.